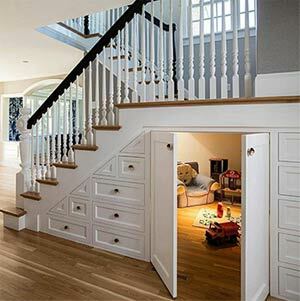 13 space under stairs design idea. Discover how to make your home more efficient by utilising the dead space under your stairs, and how you can make that space work best for you and your needs. Find out just some of the many ways that you can capitalize on storage space and get the most out of your home. In the world of home improvement and DIY, there are countless ingenious ideas on how to maximise storage space and how best to utilize every nook and cranny in your home. Here at DIY Doctor we greatly enjoy seeing just how many amazing solutions for this that others can come up with. 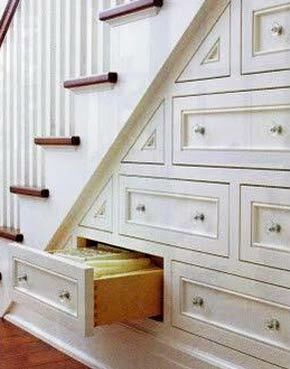 One of our favourites is transforming the empty space under your stairs into something practical and resourceful. Have you ever noticed just how much unused dead space you have under your stairs? There is a whole lot of potential and crucial storage space that is being squandered. This is true for both large and smaller homes. After all, you can never have too much space. However, before any work can be started on your unused space under the stairs, whether done by a professional or by you, you have to make sure that your stairs are safe and structurally sound. Depending on the layout of your property, the space under your stairs can offer a whole host of different options for a variety of uses. 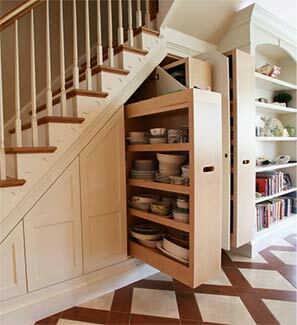 There are many homes out there that are already using this space, either as a handy under stair cupboard for storing the hoover and hanging up coats, or as a larder or pantry for your foods stuff, or even a small downstairs toilet. 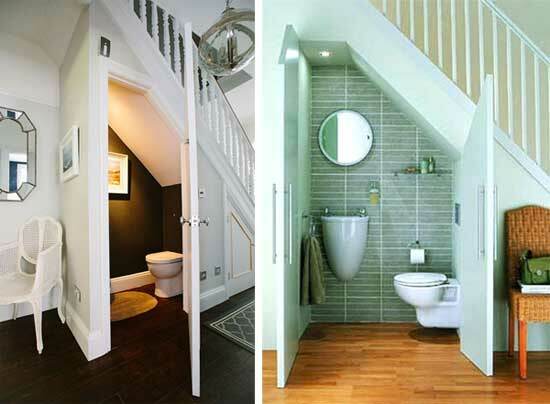 Like we mentioned above, a small bathroom or powder room as it can sometimes be called is a great way to make practical use of the empty space under the stairs. Not only does it give you a bathroom on the ground floor, which can be great when entertaining guests or with elderly or disabled relatives who may have problems climbing the stairs, it can be extremely useful for large families with homes that have only one bathroom. It has also been rumoured that adding a bathroom under your stairs (as long as this complies with any building regulations) can increase the value to your property by an average of 5%. That is pretty handy, especially if you are thinking of possibly selling your home in the future. It is a small but convenient addition to any home, even if you already have more than one bathroom. If you wish to fit the bathroom yourself, we have a detailed project on how to do just that. This covers fitting an entire bathroom, from tiling to fitting the sink, WC, and bathtub (although you won’t need that for an under stairs bathroom). Having a pantry or larder not only frees up valuable space in the kitchen, but it also gives you a larger area to work with than your average kitchen cupboards, plus you can set it up and stock it however you please! Nowadays the terms “pantry” and “larder” are pretty much interchangeable, but in “ye olden times” they were considered two different rooms. A larder used to be where one would keep their meats, usually in the basement/cellar and kept at cool temperatures. The meats would be stored in vats of lard, hence Larder. A pantry has a much more versatile function and can be used to store all manner of foods stuff from perishables to non-perishable such as bread, fruits and vegetables, canned goods, cereal, pasta, and rice to name a few. 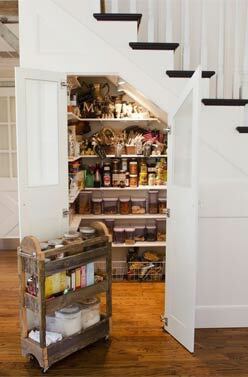 Turning the space under your stairs into a pantry/larder allows you more freedom with how you work within your kitchen. However, you understandably have to take into consideration the layout of your home there would be little point converting that space into a pantry if your stairs and kitchen are nowhere near each other. 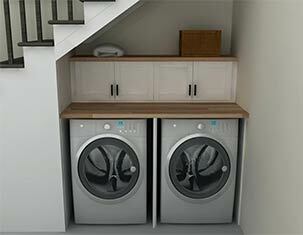 A lot of homes now come with a utility room, a room usually situated by (or connected to) the kitchen where you would find your laundry appliances and accessories such as the washing machine and tumble dryer, an ironing board, clothespins and detergents, etc. Some even have enough room to house your boiler and other white goods like your fridge-freezer. But, if your house is on the smaller side or you don’t have a room specifically for your utilities, then converting the unused space under the stairs can really make all the difference. Add a shelf or two for your laundry detergents and fabric softeners, a couple of hooks to hang up the ironing board, and some doors or a curtain to conceal it all (if you choose), and hey presto, you’ve got yourself a fully functioning miniature utility room! A cupboard is probably the most simple but also multipurposed option, and if done well not only gives you extra storage space, but something that is also stylish, practical, and well organised. 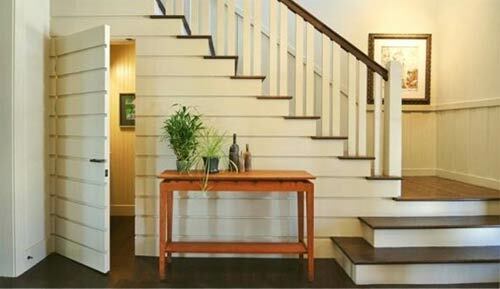 If you would like to see plans on how to build an under the stairs cupboard yourself, we have a project on exactly that. 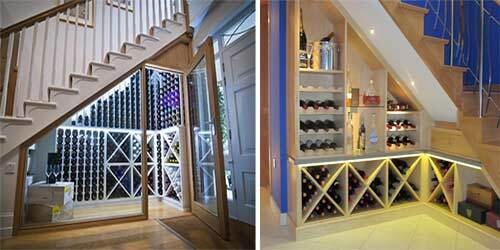 Take a look at these under the stairs cupboard examples to see what else can be achieved. Draws and/or shelving can be considered very similar to the point above, however certain differences can be observed. 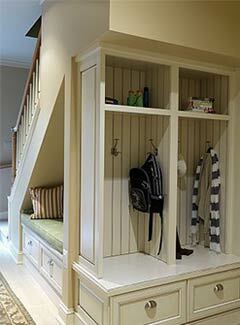 A cupboard could have (and quite often does have) shelving and draws within it, usually concealed by a door. However, open shelving is becoming more and more popular, especially in circumstances where you wish to display something, rather than merely store it. And having multiple draws can be very useful, depending, naturally, on what you wish to store within them. A mudroom is largely a US concept but it has been making its way over to the UK over the past few years, especially out in the country where people typically have larger houses. A mudroom is similar to what we in Britain would consider a porch (although that term has a slightly different meaning in America). It is a room that separates the outdoors from the indoors, usually situated at the front door (although some homes may also have one at the back door). Its main job, as you may have guessed from the name, is to keep the mud and dirt out of your home. 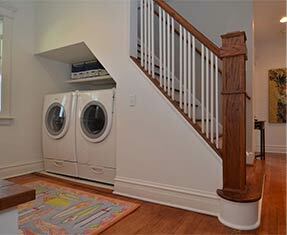 The mudroom is where you take off your shoes and coats and other outerwear before entering your home. By transforming the unused space under the stairs into a miniature mudroom not only does it make your entryway feel inviting and orderly, but it can also become a statement feature in any home, large or small. With cute but practical cubbies and shelves, a few hooks, some drawers and even a storage bench chest, this previously vacant area now makes something dull like hanging up your coats fun! Plus, if you have little ones, they will love having their own personal cubbies where they can hang up their favourite coats and hats, and their school bag. No more having to trip over little shoes and scarves strewn across the floor, or hanging off the back of chairs. Do you have pets? A cat who insists on lying across your face when you’re trying to sleep? Or a dog who has no concept of personal space and absolutely has to sit in your lap at all times? Why not give them their own individual little room? 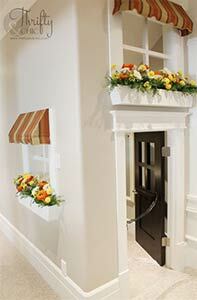 These miniature rooms will offer your beloved pet their own space, a little home inside of a home, so to say. There are so many inventive, creative, and adorable ways to achieve this under the stairs hideaway that we’ve had a hard time choosing our favourites… but here are just a few. A playroom is very similar to a pet room as they essentially provide the same function, a place for your child that is entirely their own. 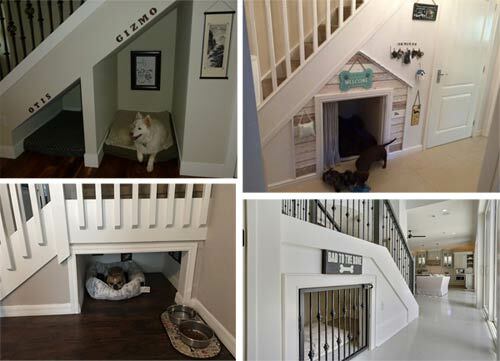 Depending on the dimensions and area space under your stairs, the possibilities are endless… the only limitations are your own (and your child’s) imagination – and of course your budget!. But no matter how much you have to spend – either in time, effort, or money – a few coats of paint, some cushions and blankets, some string lights (and of course toys!) and you’ve got yourself a rather decent playroom. And the best part is, as your child (or children) grow, their needs will change and so this space can change with them. Maybe they just need a “cool” hang-out area for sleep-overs with their friends, or perhaps somewhere suitable to study as they go through GCSEs and A-levels. If you find yourself often bringing work home, or perhaps you just need somewhere to work through your finances or other admin and don’t have the space to convert a room (or part of a room) into an office or study, the space under the stairs can be ideal. Instead of hunching over the dining room table, or squashed onto the couch you could have a home office tucked snugly into the space under the stairs. A space that is dedicated, organised, and structured around your specific needs but in a compact and well-designed area sound pretty great, right? However, as amazing as that sounds the layout of your home needs to be taken into consideration. Having an office in the entryway or a high traffic area would be the opposite of helpful if you need somewhere quiet to focus. 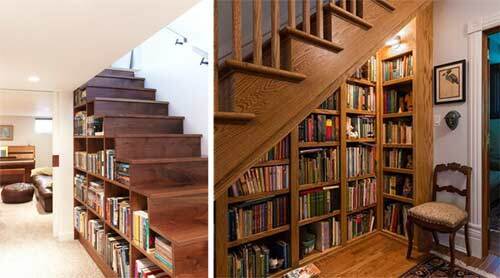 A personal library under the stairs is a great solution for both extra storage and to make a great impact. If you are a collector of books and want somewhere beautiful and timeless to show them off – or perhaps you just really love to read and need more shelf space! – designing a library in the space under the stairs bespoke to you is a wonderful solution and a beautiful home for your books. There are many different designs and layouts for this, and there is nothing to say that you can’t simply buy some ready-made bookshelves in different sizes from Ikea and stack or place them in ascending height under your stairs if you have a low budget or just don’t want to go the full hog, but that being said, the best designs are the ones that are personal to both you and your home. We have a couple of our favourites to show you what could be done. Similarly to a library, a reading nook (as it’s been known in the US) is a rather private and personal space, individual to you and your needs. It is somewhere that you can go to relax and unwind, either just as you are or, of course, with a book! 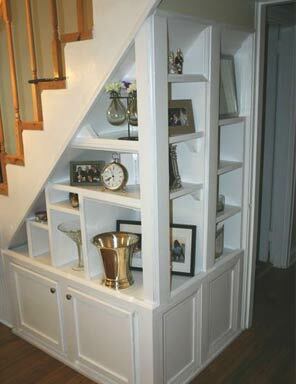 There can be many ways to fit an under stair seating area, and if you wish to maximise the storage area under the stairs then fitting cupboards, shelves, draws, and/or a seating bench that doubles as a chest is a great way to go. Of course, if you would rather keep it simple then that is entirely up to you. Whatever you do, it has to work for you. Go crazy with cushions and blankets, add some fairy-lights or wall lights, paint it any colour you wish, it’s your space. 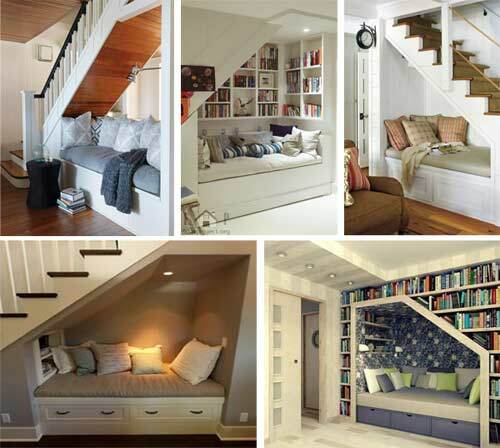 Have a look at a few of our favorite designs to give you an idea of what could be done with your under stairs reading nook. If you like to entertain, then a home bar might be the way to go. A wet or dry bar is fundamentally the same thing, with one key difference; a wet bar comes with a sink (and plumbing, obviously) where you can rinse out the glasses and equipment you use without having to run back and forth between it and the kitchen. This is obviously practical if your bar is in the basement for instance, or the garden, where that journey would be rather tedious. However, if your bar is located in the kitchen, or reasonably close by, then a dry bar would be sufficient… No need to fork out extra to have a plumber come to install a sink if it’s unnecessary, right? Of course, when it comes to converting the space under the stairs into a bar, understandably you first have to bear in mind where your stairs actually are. Is it even practical to have a bar in that location? If the answer is yes, then next you need to consider the pros and cons of a wet vs dry bar. 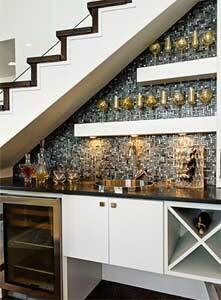 Are you far away enough from the kitchen that a wet bar makes sense? Or can you suffice without the extra sink? These are all questions that are personal to you and your home. If you find that a wet bar is necessary, but don’t want to call in a professional, you may want to try your hand at plumbing in the sink yourself. Once the question of dry vs wet is answered, the rest of the bar can be furnished however you choose. Some shelves, drawers, maybe a wine rack? How about a mini fridge or a cocktail station? 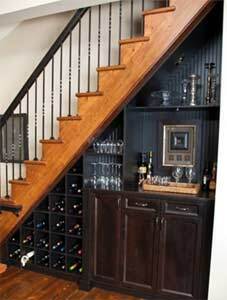 If you have a large collection of wine, or would like to start one, but have nowhere specifically designed to store it then converting the space under your stairs into a wine cellar is perfect. There are premade wine racks that are specifically designed to go under the stairs, and these can save you lots of money if you don’t want anything fancy, but if you really want to impress then have a look at these brilliant custom made under the stairs wine cellars. Of course, like with everything, these are only a few of the many different ideas for making the most out of the space under the stairs that you could come up with, there are countless options to choose from. Like we always say in DIY and Home Improvement, the only limit is your imagination. If you have any of your own ideas of what can be done with this often under utilised space or examples of any of the under stairs ideas we’ve touched on above, then please feel free to share them with us! We love to see what others have done with it! Similarly, if this project has inspired you to convert the space under the stairs in your own home, then don’t hesitate to share your progress with us!